Chef Antonio Bachour came up with an awesome dessert. 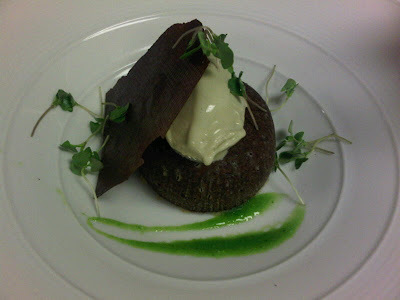 It's our famous Valrhona Chocolate Molten Cake, paired with Basil Ice Cream. Served with a refreshing Basil Syrup, Micro Basil Leaves and a crispy Chocolate Sugar Tuile.